John C. and Diane Schroeder love to travel, and they love the impact travel has on Wabash College students. The Schroeders, whose involvement with Wabash stretches more than half a century, have made a gift to Wabash that comes with a giant promise for future generations of Wabash men. The promise? Their gift to the College’s Giant Steps: A Campaign for Wabash College, when coupled with existing endowed funds, will guarantee that every future Wabash student has the opportunity for a fully funded immersive learning experience. The Schroeders’ gift is part of the largest comprehensive fund-raising campaign in the College’s 186-year history. 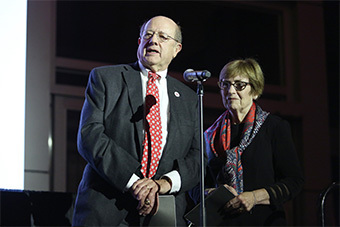 The Giant Steps Campaign seeks to raise $225 million in four specific areas: further endowing Wabash’s generous scholarship programs; funding faculty professorships, chairs, and academic programs; supporting capital projects and the Annual Fund; and, of course, providing domestic and international immersive learning experiences for all Wabash students, either through traditional study abroad programs, semester-long immersion courses, or other immersive educational experiences. At the campaign launch on Nov. 9, Wabash President Gregory Hess announced that the College had raised $150 million in the leadership phase, more than any previous campaign in Wabash history. Wabash immersive experiences routinely come at no extra cost to the student. Though the cost of each trip can vary dramatically, the College’s commitment to sending up to 275 students traveling per year marks a serious investment. John and Diane still have Sam’s letter—they keep all of their letters from Wabash students. “It’s things like that that have given us an appreciation for how these trips change Wabash men,” Diane says. John, president and CEO of Wabash Plastics and Crescent Plastics in Evansville, IN, was elected to the Wabash Board of Trustees in 1994; he is also on the Board at the University of Evansville and helps to support their international counterpart, Harlaxton College. Diane has spent a lifetime dedicated to her community in Evansville, serving on the board of numerous charitable organizations. A gifted violist in her own right, Diane also founded the Evansville Philharmonic Youth Orchestra and served the Evansville Philharmonic as its Board Chair and Advisory Council Chair. The Schroeders are continuing a legacy of giving established by his John’s father, John H. Schroeder ’42, after whom Wabash’s Schroeder Center for Career Development is named. The elder Schroeder served on the Board of Trustees, and the John H. Schroeder Interdisciplinary Chair in Economics is endowed in his honor. Immersive learning has never been more important to Wabash, and now this valuable program is set to continue in perpetuity. Especially in the Classics, Hartnett has witnessed firsthand the value of travel for his students. “Even in the best professor’s hands, the ancient world can feel like a fantasy land you only encounter in the library.” Actually stepping foot in these ancient cities, Hartnett says, makes the Greeks and Romans real. “You feel their looming presence, either by standing below a towering temple, hearing the acoustics of a theater, or feeling the roughness of their roads. Thanks to the generosity of John and Diane Schroeder, that is exactly the promise — a giant one — that Wabash now can make to future students.